A programmable load is a type of test equipment or instrument which emulates DC or AC resistance loads normally required to perform functional tests of batteries, power supplies or solar cells. By virtue of being programmable, tests like load regulation, battery discharge curve measurement and transient tests can be fully automated and load changes for these tests can be made without introducing switching transient that might change the measurement or operation of the power source under test. In 2013 I was interested in building a Programmable DC Electronic Load after watching many DC Electronic Load videos and studying simpe circuit diagrams I took on the task of building one. 1) Sink up to ~200 watts of power with adequate heatsinking and cooling. 2) Fully microcontroller based control with a LCD user interface and PC interface. 3) High resolution voltage, current and power readings. 4) Computer interface to log, view and control system parameters. After looking at many analogue programmable load designs on the internet, I started drafting my own high level design with available junk box parts I had laying around. Below is a high level design broken up into functional modules that work together. 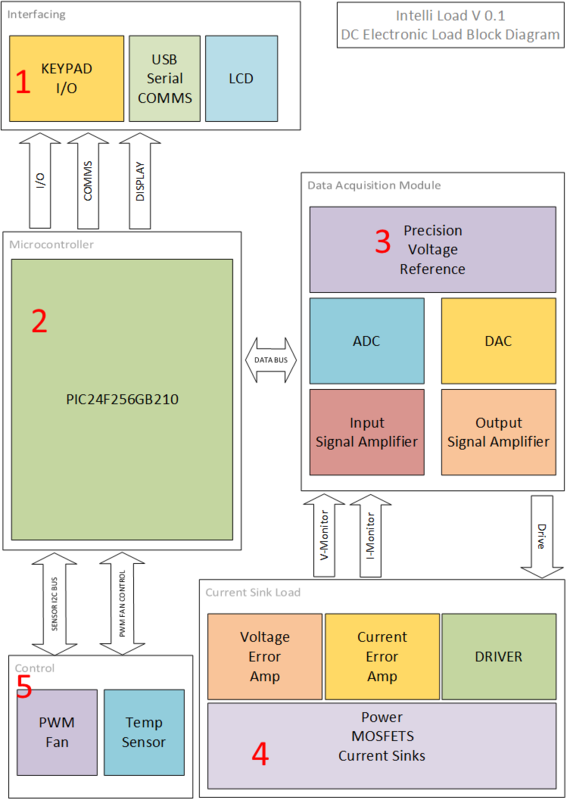 ADC (Analog to Digital Converter) acquisition stage using a Analog Devices AD7708 Sigma Delta 16-Bit ADC.